Fewer things in life are finer than combining sweet nostalgia with "sticking it to the man." It's why watching Cool Hand Luke is fun. That magic feeling gets even better when ground beef is involved. Case in point: Taco Bell's POS system allows you to infinitely finagle any food item they serve into something totally new. Meaning, you can whip up your own original creations with their ingredients, or -- more importantly -- fully re-create old favorites that are no longer on the menu. ​​​That's right. You can resuscitate discontinued items from Taco Bell just by learning how to use their ordering system to its fullest extent. Some might even call this "hacking." 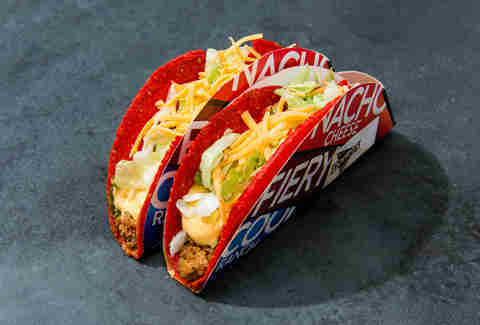 Here are seven popular items you can bring back from the Taco Bell morgue, just by being very specific when ordering. Taco Bell's Volcano Period, circa '08, was a special time in all of our lives. The Dark Knight was burning up the box office, Flo Rida and T-Pain's "Low" was burning up the airwaves, and TB's Volcanic menu was burning up... well, we all liked it, that's all. And while this repurposing of current ingredients can't fully capture the magic of the original, it can come damn close to making you feel some semblance of closure. Kind of like the Dark Knight Rises, actually. A product of Taco Bell's moderately short-lived Sizzlin Bacon Menu, the BLT takes all the wonder and mystique of a BLT and jams it into a soft taco. It was a nice thing to have on the menu, and now that the chain is serving bacon again (on their breakfast menu), you can will it back into existence. 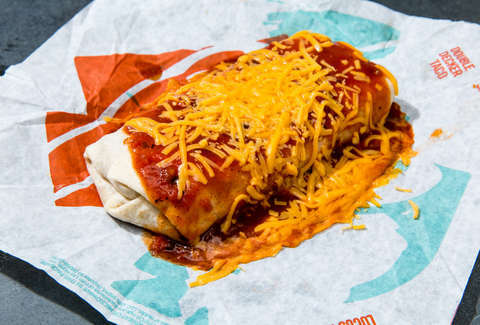 The Enchirito may be the most sought-after ex-menu item in Taco Bell's graveyard. And it is pretty good -- it almost makes you think you are at a real-deal Mexican restaurant, especially if you have a few Baja Blasts in you and a cloth napkin in your pocket. The Enchirito is so popular, you might have luck just straight-up asking the cashier for one, even if it's not technically on the menu. They might still have a button for it, or, they might just know exactly how to make it and just do it. If not, do this. If you are taking it home, just pop it in the microwave or oven yourself. And this way, it won't get soggy on the ride home, and you won't be tempted to whip it out (the food) behind the wheel. This one is... pretty easy. But, it's best not to overthink this stuff. I just don't know why they got rid of these. It's almost like they are doing things to hurt me, exclusively. 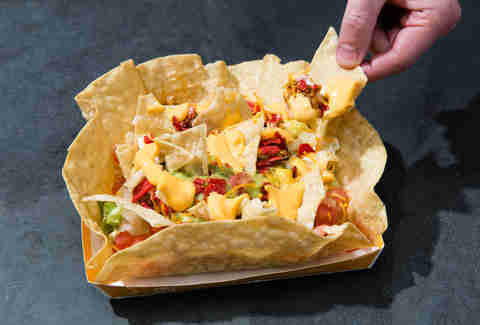 Basically, they were... well, fully loaded nachos. You get it. This is how to bring them back. There's no use in puffing this one up: it's basically a grilled cheese inside a burrito. Yeah. But hey, I'm sure someone out there misses it. It's the kind of thing you make in the microwave when your parents aren't home. There are a few different methods to craft this warlock, but this one is best. Why? It just is. Ask for NO BEANS. 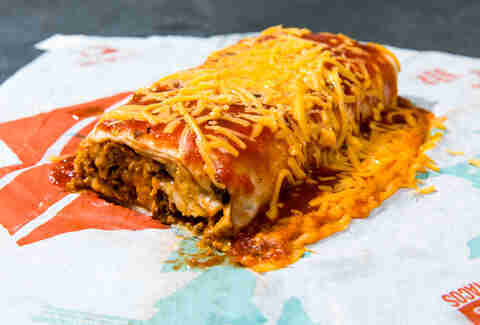 You might want beans, but this isn't about what you want, it's about what a Cheesarito is. Add extra cheese. Tell them to just add a ton of cheese. The Grilled Stuffed Nacho was actually pretty amazing. It makes you wonder why Taco Bell took it off the menu. Are they just toying with our emotions? Are they playing some sick, subversive, sadistic, mass-psychological mind games with consumers? Did they just find it unprofitable? Who knows. But anyway, you can get pretty close to it, with some minor tweaks. 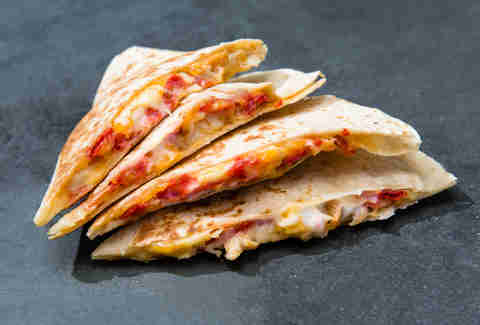 THIS IS IMPORTANT: While you can just go for the quesadilla and eat it that way (almost the same, if less portable), the original dish was folded in a triangle like one big nacho, so this isn't truly identical. If you have time (and there's not a line of angry New Yorkers standing behind you, possibly brandishing switchblades) you can even ask if they'll "fold it like a nacho." Or, ask them not to cut the quesadilla, so it's all intact. Wil Fulton is a staff writer for Thrillist. If you told him he could only eat one food for the rest of his life, he'd be frightened and confused. Follow him: @wilfulton.